Many school, college and university in Bangladesh celebrates Soborno Isaac's 6th Birthday. For youths in Bangladesh, April 9 became a synonym of "Falling love with math & science"
my first bachelors in Political Science. Here, I earned my first bachelor's degree in political science; however, I love York College for a different reason. One day in 2006, as a student of York, I asked the Vice President, Prof. Posman, to undertake an initiative that would enable unprivileged children of Grameen Bank, a microfinancing program that had won the Nobel Peace Prize in 2006, to study at York College. The culmination of these efforts transpired on February 11, 2008, when Muhammad Yunus, the founder of Grameen Bank, appeared at York and launched the scholarship project. In fact, Posman inspired me to write Yunus’ biography. Ever since, I have written extensively in English and Bengali about Yunus in books, poems, songs, magazines, newspapers, and films. Here, I earned my first master’s degree in political science; however, I love Brooklyn College for a different reason. In 2009, Dr. Mark Ungar, my master’s thesis advisor at Brooklyn College, asked me to write my thesis on Grameen Bank, including how its founder developed the ideas of microcredits and social businesses. My job was to place Yunus’ concepts within the context of economic theory. However, as soon as I started writing it, I realized that I lacked the necessary competency in economics. Hence, I decided to pursue a second degree in economics at CCNY. After applying my newly learned skills to the thesis and submitting it to Brooklyn College with great expectations, I learned that what I had accomplished was more than was necessary. Hence, Dr. Ungar helped me publish Grameen Social Business Model, which is available from retailers such as Barnes & Noble and Amazon.com. The success of this book paved the way for my recognition as a writer. On the morning of August 16, 2012, I received the biggest news of my life from the Times of India, the largest newspaper in the world: I was invited to become a contributor. Here, I earned my second bachelor's degree in economics, but I love CCNY for a different reason. Taking a physics class with Michio Kaku at CCNY changed my entire view of the universe. He pulled me from the easy world of political science and economics and pushed me toward the difficult world of math and science. He persuaded me to pursue a career in science not because I did extremely well in his class but because youths—especially Muslim youths—are falling behind in math and science. He also helped me to write many scientific articles including, “Who Is Actually Insulting Islam,” which appeared in the Times of India. In this article, I made the analogy: When do the lives of 15 million Jewish people have a greater value than 1.6 billion Muslims? The grave humor of such an extreme analogy was to remind Muslims about the consequences of neglecting education and focusing too much on religion. The influence of Kaku was so enormous that I could not escape from it. Therefore, instead of commencing a Ph.D. in political economics, I decided to enter into the world of math and science. I chose Lehman College to pursue my third, fourth, and fifth bachelor's degrees in math, physics, and computer science. However, I had no idea that this would eventually lead me to meet my greatest teacher of all: Dr. Daniel Kabat. It was, actually, Kabat who made me think like a scientist. Currently, I am collaborating with him on a mathematics-physics book titled, Beautiful Mathematical Laws of Physics, which is set for release in January 2015. I’ve earned three undergraduate degrees from Lehman College: Bachelor in Mathematics, Physics and Computer Science. I truly value the importance of the banners that are posted across Lehman College campus that feature the faces and titles of notable alumni such as Ruben Diaz. In fact, I have always aspired to become as accomplished as those individuals. However, I never thought that Lehman would feature some one like me on its banners. This is why; I was tearing up upon learning that Lehman College featured me on its Campus banners. Recently, Dr. Kabat visited my Physics Class to hand out the prizes for the Winners of the Genius Competition. It should be noted that I launched the Genius Competition at AMS to motivate my students to work hard. It was great seeing you today! Thank you for allowing me to share my accomplishment with you. When I chose Lehman some 4 years ago to pursue 3 degrees, Math,Physics & Computer Science-it seemed like I signed in to accomplish an impossible dream.However, when I went to Lehman College today to pick up my certificate, I felt much gratitude to the Lehman Family who helped me interchange the impossible and make it Possible. These 3 degrees allowed me to get into NYU as a scholarship student. Without these 3 degrees from Lehman,I would never have been where I'm standing right now. Speaking of NYU, I have been trying to initiate a campaign at NYU to launch education to correct the behavior of Islamic Jihadists since June 2014. In fact, this has been the main idea of all of my recent articles, HERE. Ive been working on a book on the same topic to accelerate the momentum of this campaign.In fact,Im visiting Washington DC next week to promote my articles. 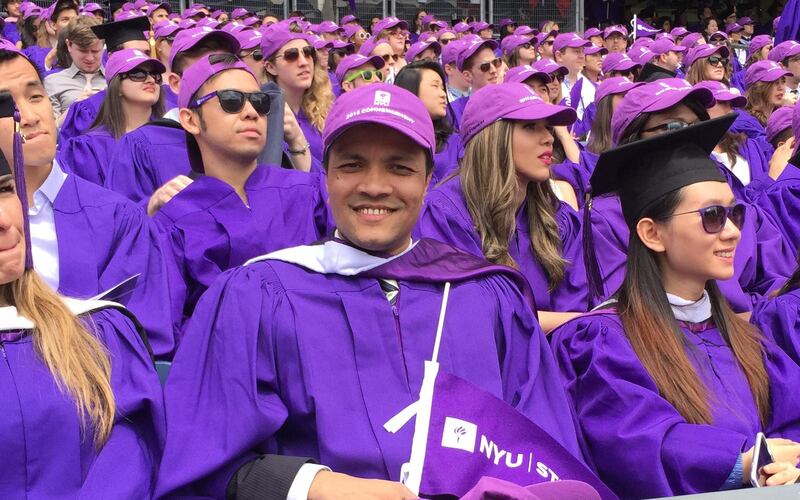 In 2014, I entered NYU as a CRISP scholar and in 2015 left NYU as an Adjunct Professor of Math at CUNY Baruch College and as a Physics teacher at AMS. Although I graduated from NYU as a CRISP Scholar with a GPA of 3.98, I like it for a different reason: I fell in love with its library, during my first visit to NYU. In fact, Bobst has become my second home. Over the past 2 years, I have spent more time inside Bobst than I have my own home. I fell so much in love with Bobst that sometimes I would stay overnight—not only to study for class but also to write. As a child, I watched my native country of Bangladesh drown in political despair and corruption. My hobby of writing fiction, poetry, songs, and columns turned into my self-expression of the injustices I saw among my own Bengali people. My fermentation as a writer led me to publish my first Bengali novel at the age of twenty. Now, at thirty-four years old, I have published nearly twenty-five books, most of which are in Bengali. (A simple Google search is enough to find detailed information about my Bengali books.) Although as a writer I am a household name in Bangladesh, I no longer write in Bengali, for since 2001, I decided to write in English only. In fact, 9/11 has changed my life. I was working at near World Trade Center when terrorists attacked the Twin Towers, and my brother was in the South Tower (World Trade Center II). I got caught in the fallout of the first collapse (North Tower), and I ran toward the South Tower to find him. I couldn't outrun the smoke, and crawled under a van to avoid the debris. But I started choking, and my eyes burned; the air had turned black. I thought the van would move and kill me. Someone dragged me into the van and I later discovered myself in a hospital. In a panic, I fled the hospital and ran toward the Twin Towers again—with the hope of seeing my brother there. I went north on the West Side Highway, along with thousands of other terrified people. More than 100 years ago, Ralph Waldo Emerson said that there is a foolish consistency is the hobgoblin of little minds. When one becomes enamored with a principle, as have the ISIS, one also becomes blind to the alternatives. For such, it is as though a hobgoblin or a monster has entered their imagination that blocks any new ideas and the ability to see different perspectives. We certainly witness this blindness in the ISIS today. However, NYU has helped me discovered a weapon against them—Education. Through Bari Science Lab, which I launched upon receiving support from NYU President John Sexton, an anti ISIS campaign website, I promote how to use this weapon to remove these hobgoblins from the imagination of ISIS terrorists. It all began in Sept. 11, 2001,when – as I mentioned – the terrorists attacked the World Trade Center, which nearly killed my younger brother. So far, my campaign has received support from many leaders around the world, including French President Hollande. I hope it will receive your support as well. Thank you. I’m writing to you while Isaac & Albert are celebrating Father’s Day along with the whole world. Wait a minute! Unfortunately my statement has flaws: the whole world does not celebrates Father’s Day. Millions of children (e.g., Omar Mateen’s son) do not celebrates Father’s Day. While, today is the best day for Isaac & Albert, it is also the worst day for Omar Mateen’s son because his Father was a killer, a mass murderer, and a monster. While Isaac and Albert feel lucky that they are sons of someone like me, Omar Mateen’s son regrets being the son of terrorist. So I’m actually writing to you with a heavy heart: A hole was created in my heart when Islamic terrorists attacked the World Trade Center. Over the past 15 years, I’ve been trying so hard to somehow right the wrongs done by Islamic Terrorists. However, my pain became much more worse on Sunday, when I learned that Mr. Mateen killed more than 50 innocent people in Pulse Nightclub, Florida. My hope for this article, I'm Muslim & I Love Gays, is that it will help correct the behavior of potential terrorists who can become as dangerous as Mr. Mateen. My article is attached. BTW, I also made a film today. The name of the movie is “Happy Father’s Day!” The story of the film captures the essence of the article. The main intention in making this movie and releasing it on Father's Day is to inspire millions of fathers to nurture the curiosities of their children, because nurture is more powerful than nature. It is not God who makes Isaac Newton, or Albert Einstein, but parents. I invite you to watch it from Youtube. CUNY & NYU gave me advanced training in math, physics, and computer science—all of which I have been utilizing to help my Math students of Baruch College, and my Physics students of AMS. I am currently teaching two sections of Math 2003 at Baruch College, to about 50 students, almost all of who have wrote me personal letters stating how I was the best teacher they have ever had. I teach 4 classes of Physics students at AMS, to about 80 Students. Sometimes I lay down on the bare street to help make the trigonometry problems for my students more exciting, while other times, I use my top 10% of students to tutor the bottom 10%, whereas other times I utilize peer pressure to get the best out of my students who lack attention. I commonly make movies to inspire them, and code simulations to help them visualize and make topics such as “Did Mr. Bari break the Law” to make calculus and physics more exciting. This is why my students not only love me, but also my website – Bari Science Lab, which they visit frequently, and I update a few times every day. I want to become a servant of education because I want to influence so many young people, especially young Muslims who have been bred to religious passion—understand that there is something more important than politics, such as solving math and physics problems, as well as developing algorithms, and discovering new technologies. 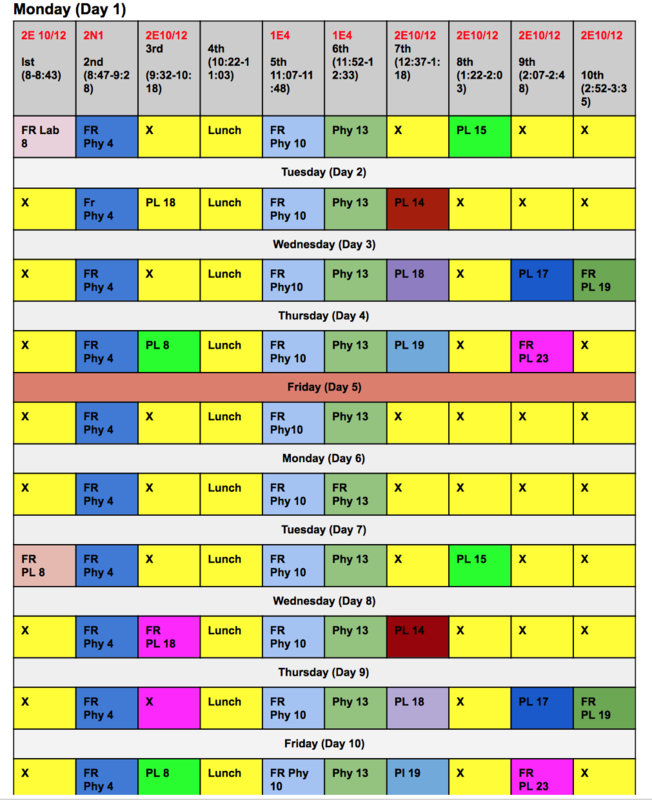 Fall 2016 Teaching & Learning Schedule. "4 Year-old Einstein & President"
This time last year, my mother came to New York University to promote my article, Israel & Palestine. This year she is in Bangladesh. I miss her so much today. Happy Mother’s Day, mom (NYU Bobst, 5/10/15). I’m standing in front of Bronx Collaborative High School wearing a Black tie with green stripes. This tie, which I got from Prof. Jason, not only represents a symbolic “good luck” but also demonstrates the beauty of a student-teacher relationship. I will treat my students much the same way Prof. Jason has treated me.